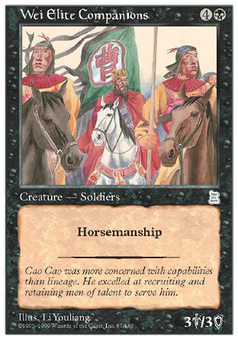 Cao Ren, Wei Commander ($25.94) Price History from major stores - Portal Three Kingdoms - MTGPrice.com Values for Ebay, Amazon and hobby stores! 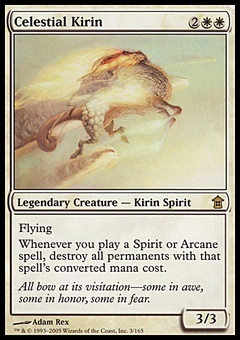 Card Text: Horsemanship (This creature can't be blocked except by creatures with horsemanship.) When Cao Ren, Wei Commander enters the battlefield, you lose 3 life. 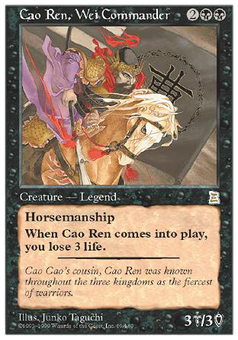 Flavor Text: Cao Cao's cousin, Cao Ren was known throughout the three kingdoms as the fiercest of warriors.